During last year’s three-event match race series between Top Fuel legend Larry “Spiderman” McBride and impressive third-year nitro racer Dave Vantine, many would agree, the real winners were the fans. The talented duo brought the crowd to its feet and set the internet abuzz by producing the sport’s first side-by-side five-second pass. “It was awesome. Hopefully we can repeat it,” McBride said. Technically it was Vantine who won the overall season series, bettering his mentor two races to one, after McBride encountered some of the most devastating breakage of his career at Maryland International Raceway in the fall. Vantine is hoping to outrun his riding coach without the mechanical failures this season. 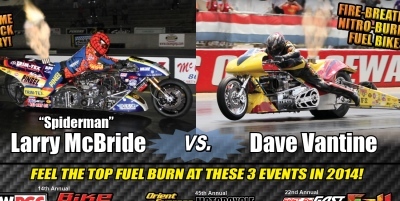 Larry McBride vs. Dave Vantine, always entertaining. Although the match race is merely an exhibition, anyone who knows McBride understands the competitive nature of the 14-time champion. McBride is focused on rebounding with the best performance of his career. Will we see 5.60s from team McBride? 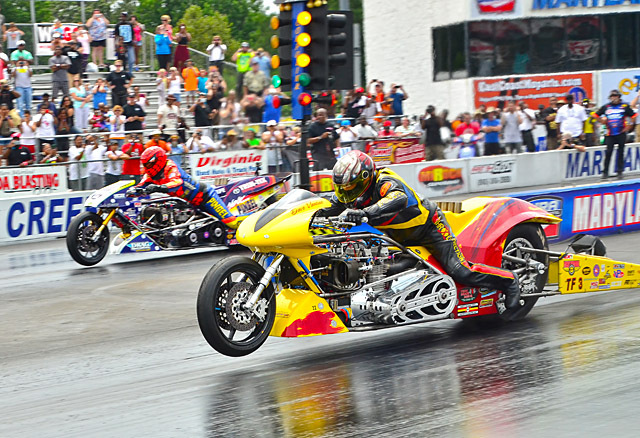 The season series gets underway at the 15th annual IDBL WPGC Bike Fest from Maryland International Raceway, July 24-26. Vantine thanked all of his supporters and his entire team. Web-Cam, Vance & Hines Motorsports, PR Factory Store, Ferrea Valves, Kibblewhite, Precision Machine, World Wide Bearings, Vanson Leathers, Millennium Technologies, Belt Drives Ltd, Simpson Race Products, Nitrous Express, APE, EK Chain, Arias Pistons, Cometic Gaskets, B&J Transmission, Carolina Cycle, L.A. Sleeve, PJ1, Mickey Thompson Tires, Valco, Goodridge, Carlisle Belts and Gates Belts.